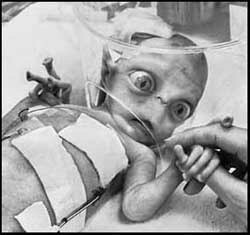 Nurse caring for the 'star child' says she is more human than alien. Amy in 1993, shortly after her rescue. WASHINGTON -- Aliens from space are demanding the immediate return of the so-called "star child" who was discovered from the wreckage of a UFO by the U.S. military six years ago. But the Obama Administration is reportedly balking on any return of the child. Government insiders fear that, if not resolved, the escalating dispute could lead to an interstellar war! Officially, the government maintains it doesn't even know the whereabouts of the alien tyke. "The United States has never confirmed the crash-landing of any vehicle of extraterrestrial origin and no infant was ever recovered from such a site, nor is the child at this time in the custody of U.S. authorities," a government spokesman said in a brief written statement. But off the record, insiders admit that after the accident, the pointy-eared, bug-eyed girl -- who is called Amy -- was whisked away to a top-secret New Mexico installation for study. "That kid is of tremendous scientific importance," a Pentagon insider said. "There is no way our researchers are going to just turn her over." The crisis reminds many of the emotionally charged custody case of six-year-old Alberto Gonzales, who became the pawn in a struggle between Cuban immigrants in Miami and dictator Fidel Castro after the boy's mother died at sea while trying to flee with him to America. The star child, as she has been dubbed by the press, was the sole survivor of a UFO that slammed into a desert mesa. The charred bodies of four adult occupants -- among them perhaps the newborn's parents -- were also found at the site. News of the dramatic discovery made headlines worldwide and was featured in the Oct. 12, 2003 issue of Weekly World News. Since that time the star child has been raised at the base by a loving nurse she calls "Mom" and tutored by top scholars from around the world. "Amy is only six years old but she's doing calculus and speaks 17 languages," said a researcher at the base who leaked rare photos to the News. "Her I.Q. has been tested at over 190." Cuddly little Amy is shy but affectionate. She has incredibly large, warm eyes and long fingers that taper down to suction-cup-like tips -- which she often uses to cling to her beloved nurse. As reported in the News, officials recently made an effort to have the girl moved to a bigger lab where more extensive tests could be conducted on her incredible brain. But when the plan became public, an outpouring of letters from around the world -- including from concerned News readers -- convinced authorities to leave the star child right where she is. No word from the aliens about the stranded girl came until January 1, 2007, when a radio message was reportedly received from deep space, stating, "Give us the child or else." But researchers claim that beyond the star child's scientific importance, there is a humanitarian reason for keeping her on Earth. "Amy has a good home now and is more human than alien in her behavior," insists the nurse, who spoke on the condition of anonymity and has asked for permission to adopt the star child. "She thinks of herself as an Earthling girl now and would be terrified about returning to space. It would be wrong and cruel to send her back."